Benjamin Creech and Charles Flora, both of Lexington, were fishing the South Fork of the Licking River on Sunday afternoon, when they got hung up above the A. Keller dam. 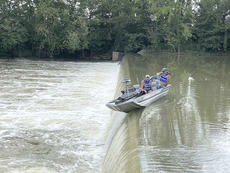 The outboard motor on their Bass Tracker kept them from going over the dam. They were rescued by members of the city and county fire departments.